Using meditation cushions is a great way to maintain the correct sitting posture during your meditation. They also help with keeping your legs from falling asleep and easing stress on your hip and knees. If you are serious about your meditation practice, then consider purchasing a meditation cushion or a meditation bench. It offers a comfortable and set area to practice your meditation. Many of these cushions will also add some decor to your home. There are many types of pads and pillows you can use to make your next meditation more comfortable. So let’s get comfortable with these products. The My Zen Home Dhyana Meditation Cushion offers comfort, support and flexibility. The meditation cushion is 100 percent organic. It comes in many different colors and styles. It’s one of the most comfortable cushions on the market. The best feature of the cushion is it’s fold-able nature. This meditation cushion can fold into several different positions, allowing for better support. The My Zen Home Dhyana Meditation Cushion is designed to maintain a straight spine. The base square on the cushion protects ankles and knees from hard surfaces. It’s easy to clean. This cushion is also multi-functional and can be used as seating in your home. The Waterglider International Zafu cushion is comfortable and puts you in a good posture. The meditation cushion is well made. It’s at least 6 inches high and packed full. You can remove the filling to make the cushion work better. The inside liner has a small zipper on the side where you can take out (and add back in) material. The cover can be easily washed. Great cushion. Firm and tall. The fabric and craftsmanship of the Zabuton & Zafu set are superb, and the cushioning is pure perfection. It’s not so soft that you sink in, but they’re not so firm that you may as well be sitting on the floor. This set is very comfortable and wears well. The price is very reasonable and the cushion is the right size for meditation. The Zabuton is very comfortable with good back support. The cushions are the perfect height for cross-legged or full lotus meditations. It positions you for great alignment and looks great too. The design of the cushion will not allow your feet and legs to go numb. It will elevate you enough to retain good blood flow. D&D Futon Furniture Black/Gray Zabuton Zafu Set, Yoga, Meditation Seat Cushions, Kneeling, Sitting, Supporting Exercise Pratice Zabuton & Zafu Cushions. The YogaAccessories Zabuton Cushion is a flat, durable pillow that works great for meditation. The cushions are thick and made of good quality materials. It’s a perfect cushion. Works great and is very comfortable. Has a great removable cover that can be machine washed. Just the right size and very comfy! The Cosmic Cushions shape will really support your legs and the cut out in the center allows your heels to rest naturally close to your body. The buckwheat container comes with a zippered opening to allow for removing the hulls to adjust height and comfort. The cover is made of durable cotton twill fabric and is zippered so it can be removed for washing. The meditation cushion comfortably cradles the bottom of your legs and doesn’t make my feet go numb. An outstanding meditation cushion for longer meditation sessions. Recommended for people with difficulty sitting on the ground or even with round cushions. This cushion supports the knees beautifully. Not too hard, not too soft…just right. The Bean Products Zabuton Yoga Meditation Cotton Cushion is a very well-made product with a substantial cushion inside the cover. The zippered cover is removable and washable. Just the right size and thickness for longer sessions. Lightweight and can be folded in half when not in use. This is a good cushion at a very good price. Makes your sitting practice very comfortable. The YogaDirect Cotton Zabuton Meditation Cushion padding is heavy enough and thick enough to be comfortable on a hardwood or concrete floor. It does its job and does it well. It’s got a nice appearance. This item is also good for meditation travel. The Meditation Designs Mediation Bench looks great, is very stylish, made of good quality material and is comfortable. This meditation bench measures in at 18″ in length and 8 inches wide. The bench is designed to promote comfort and help in keeping the spine straight. It will fit great with the other furniture in your decor and is perfect if you have a separate meditation area. Check AliExpress.com for your next meditation cushion. 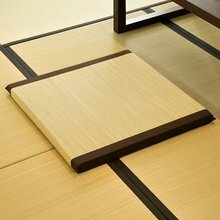 AliExpress.com – Zen Cushion Zabuton Zafu Square 65cm Floor Meditation. AliExpress.com has a huge selection of meditation cushions. Meditation cushions can help you maintain a good posture. If you meditate often a cushion can keep you comfortable and will be a great long-term investment. Any of these cushions would be an excellent addition to a meditation studio, room or sitting area.